I consider Janelle one of my conference buddies. We met a few years ago at an SCBWI Carolinas conference and now we make sure to seek each other out and catch up every year. Janelle is easy to like. She has a wide range of interests, is always cheerful, and I’m convinced she doesn’t have a selfish bone in her body. 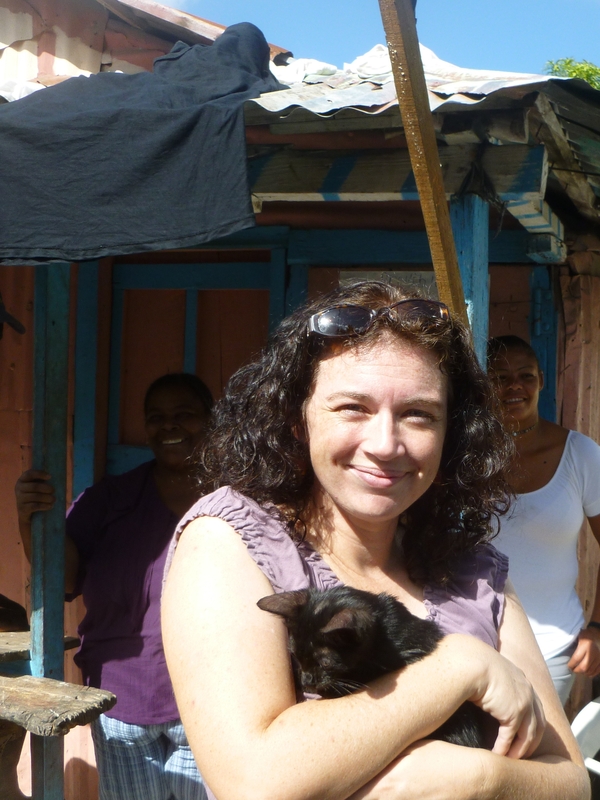 She missed this year’s conference because her humanitarian work has taken her to the Dominican Republic. I was thrilled when she agreed to do an interview for Nerdy Chicks Rule, and even more thrilled after I read her amazing answers. They made me wish I saw my conference buddy a lot more often. I think all who read this interview will wish you knew this inspirational writer and humanitarian too. Thanks so much for joining us today, Janelle! What social norms are you fond of flouting? I like the idea that, `different isn’t bad – it’s just different,’ especially when talking about people. People are like snowflakes. No two of us are exactly alike. I love learning about people who have different cultures, different languages, and different life situations than me. It’s always easier to hang out with people who are like me all the time, but I don’t think that that would help me understand the world better. So I make friends in many places. As a child I lived on a Native American reservation. As an adult I’ve been privileged to become friends with migrant workers, homeless folks, foreign exchange students, doctors, artists, and lots of other amazing snowflakes. I’ve spent time in Russia, Ireland, and other countries, as well as on the park benches in the U.S. where our homeless citizens still feel forgotten. 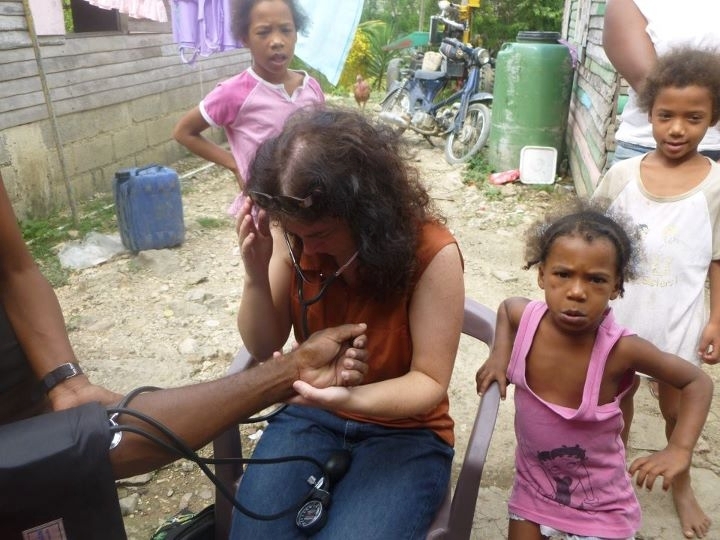 Right now I live in the Dominican Republic providing humanitarian medical care in low-income communities. But all around the world everyone I meet has a story. I like to hear those stories and experience their lives, and join in, to become a part of their world. That was beautifully said. Imagine a world where everyone felt that way. It would be a lot closer to paradise, I think. Can you tell us about a time when nerdiness turned out to be an advantage for you? Though I’m a pretty right-brained person I’ve always had an interest in science and technology. That can partly be blamed on my love of Star Wars, I suppose. About 7 years ago I was researching spaceports and robotics for a fictional story I was writing. NASA’s Mars Rover Mission had just landed two Robot Rovers named Spirit and Opportunity on Mars. I called NASA to see if I could interview one of the mission leaders on the Robotics Team and was thrilled to get the chance to meet NASA’s Lead-Roboticist on the rover mission, Ginny Gulick. She shared her amazing life and work at NASA with me, and I was thrilled to see a woman leading such an important, high-tech team. I wrote a magazine article about Ginny and the Mars Rover Mission, and that started my freelance magazine writing career. That interview opened the doors for me to interview other amazing people working in Space Science and to learn more about space travel, robotics, the Ansari X-Prize, global spaceports, rocket racing, and many other spacey things. My space-science writing has even gotten me a behind-the-scenes visit to U.S. Space Camp. Holy space-tomatoes! Thanks Ginny. Ginny sounds like an awesome nerdy chick herself. It’s great that you got to interview someone with so many cool achievements. Do you have any favorite achievements that you can credit to being a nerdy chick? It’s not really an achievement, but I love those moments when I’m in a crowd of really smart people who know me as a social worker, a writer, a humanitarian, or an English teacher… and who like to put people in boxes. And then someone starts talking about space science, or technologies that I’ve written about, and… Ha! “Yes I do know the recommended trajectory for a spacecraft taking off from Las Cruces, New Mexico, thank you very much!” I love watching them choke on their wine in surprise. But, hey, writers know lots of crazy stuff. That’s why we’re great at Trivial Pursuit! I’m starting to see a Trivial Pursuit trend among writerly types on my blog and it’s making me nervous… because I’m not so great at that game! Now for my favorite question: If you could give your middle school or high school self one piece of advice, what would it be? Never be afraid to try new things. You will sometimes fail. You may look stupid. But the easiest way to fail is to never try. Great advice! Tell us about a well-known fictitious chick you admire and why you admire her. Since I often write for, and about, teens/young adults, I’m choosing Elizabeth Bennet, from the book Pride and Prejudice, written by the brilliant Jane Austen. Elizabeth wasn’t afraid to by-pass the social norms that were expected for women of her day, and women in her financial and social situation. She wasn’t afraid to be different. She remained true to herself, loving books, and words, and the beauty of life. She stood up for what was right and for people she loved, at great personal risk. To me, that’s heroic. Can you share a favorite song, quote, or movie that speaks to your inner nerdiness? Do you credit your brain power for helping you with your overseas work? What about being a nerdy chick helps you live abroad? It’s definitely important to use your brain power when working and living abroad! In the Dominican Republic I live in an area of stark poverty. But it’s also an area where people from all over the world have come to live. I’ve been in places here where people speak to me in Spanish, English, Russian, and Haitian Kreyol all in the same day, and sometimes all in the same conversation. This can happen in the U.S. too. I love the magic of that kind of multi-lingual experience, and I’m definitely glad that I studied Russian and Spanish in high school and college. Still, it’s a challenge. Being able to understand each other makes the world go ‘round, and it definitely requires brain power. My favorite hobby outside of traveling and writing, is photography. I love watching the world and the people in it do what they do through the impartial lens of the camera. I love capturing those unexpectedly beautiful moments of life and nature and man-made skylines that are worth keeping. Photos, like books, tell great stories. Janelle does take beautiful photos. 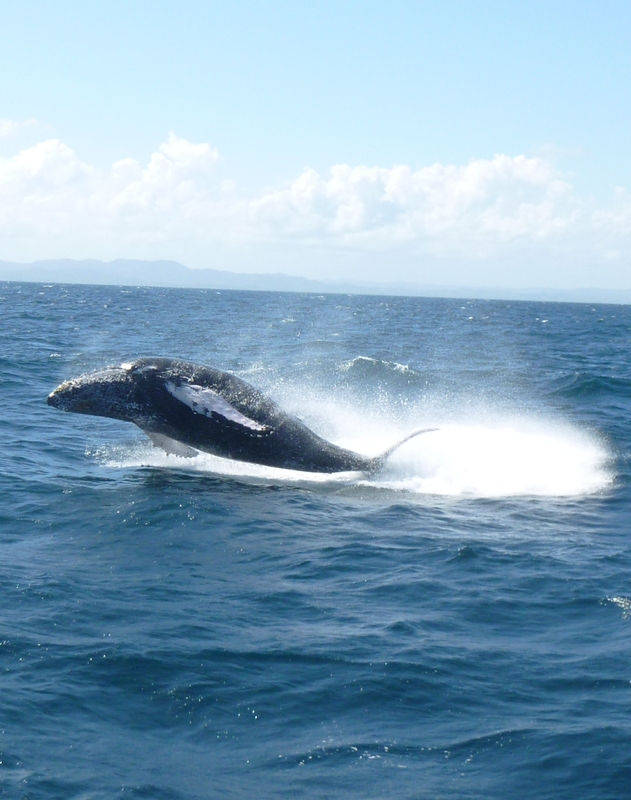 Look at this shot she got of a whale recently! Awesome! To find out more about Janelle visit her blog at www.writermorphosis.blogspot.com. Thanks so much Janelle for joining us today! This entry was posted in Nerdy Chick Interviews and tagged Dominican Republic humanitarian workers, humanitarian writers, Janelle Bitikofer writer, Jannelle Bitikofer, SCBWI Carolinas. Wonderful interview with a beautiful person. Thank you. Thanks Kelly. I agree. I told Janelle that this interview made me wish I knew her better. We always talk writing, but look at all she has experienced! It’s always wonderful to hear from Janelle! Thanks for posting.